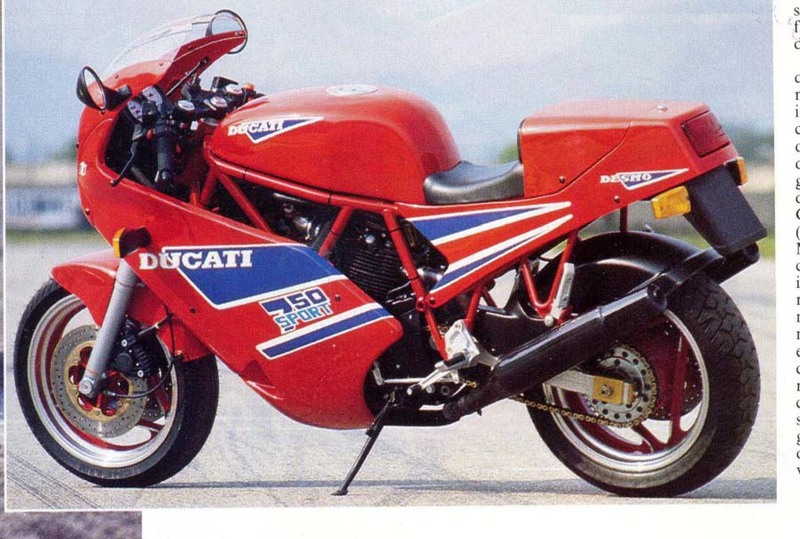 What is the Ducati myth made of? Performance, mechanical finesse, lean, essential racey look and allure, low pitched sound of power, crude yet functional execution. 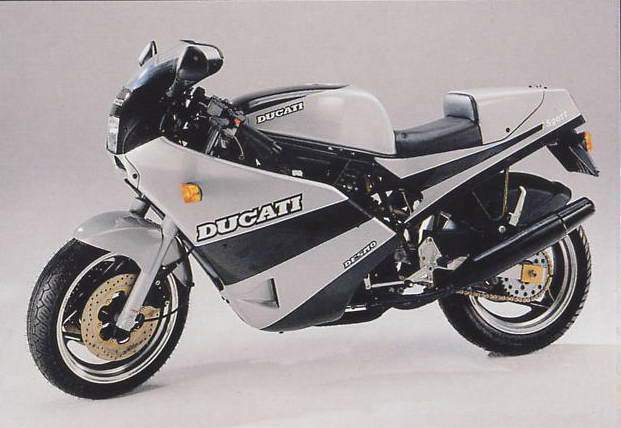 Ducati's recent marketing policy tried to tread outside this traditional turf with the 750 Paso. Yet the beautiful Paso has its problems. There are markets which have given it a charming receipt, while others have rejected this kind of civilised Ducati and have reverted to more traditional and hirsute models. Paso is very much a Ducati in its best form: great handling, sincere, inherently sport orientated, yet civilised and with one shortcoming: she looks like doing 160mph while still, and then she will barely edge past 125mph when pushed for real. We might call it a too low performance-to-look ratio. Now someone at the Factory has picked that same technical essence and has transplanted it into a bike which responds to the parameters of the Ducati tradition. 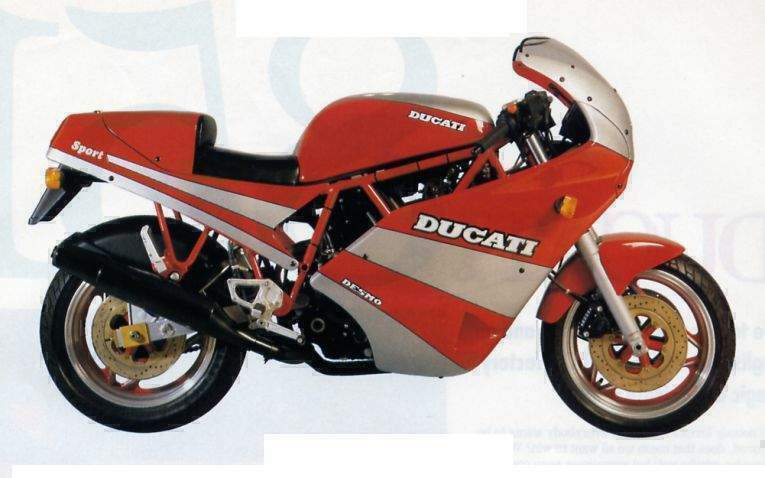 The result is: Ducati 750 Sport. The Paso, in fact, has supplied the power unit in its whole, original form, very legal mufflers and filter included. It is a package good for 62 bhp, net at the rear wheel, with plenty of torque from as low as 3,000 rpm up, till it levels off at 7,500rpm and tails out at around 8,500rpm. The frame basically is a 750 Fl Replica unit modified in the upper-front section to accept the very large filtering unit which serves the automotive type inverted twin barrel Weber DCNF 11 carb of the central induction system. the very light weight of the bike, which saves the day as far as nimbleness is concerned, and the rearward bias that the weight distribution develops when thefider is in position. Yet I would have liked to see how a Paso-like geometry would make the front end behave. 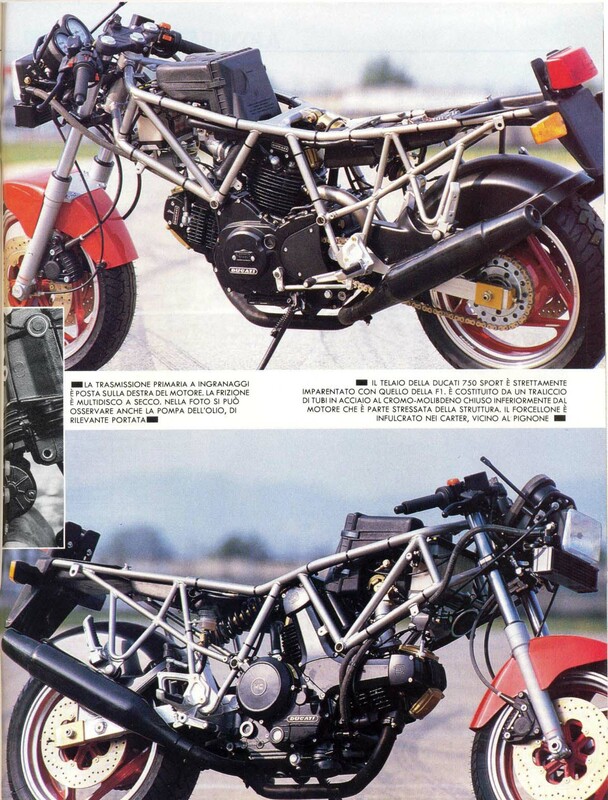 The frame passed the Misano Santamonica Track acid test with flying colours. Stability was perfect, high speed tracking around the very fast bend which splits the main straight in two was immaculate, total confidence inspiring, solid and easy. As a matter of fact, the light and spirited 750 Sport proved more precise than an 851 when it came to go around that same fast bend at about the same speed, between 180 and 190 kmph. 750 Sport's great point is that she is superb around the tight section of Misano's track as well. An ergonomically excellent riding posture helps those who like to ride "K R Style" shifting their body weight to the inside of the corner to take full advantage of the enormous amount of grip that the fat Michelin (or Pirelli) radials develop even at extreme (45° plus) leaning angles. Talking of riding posture, it must be pointed out, to the praise of the overall enjoyability of the bike, that it is in perfect sintony (?! 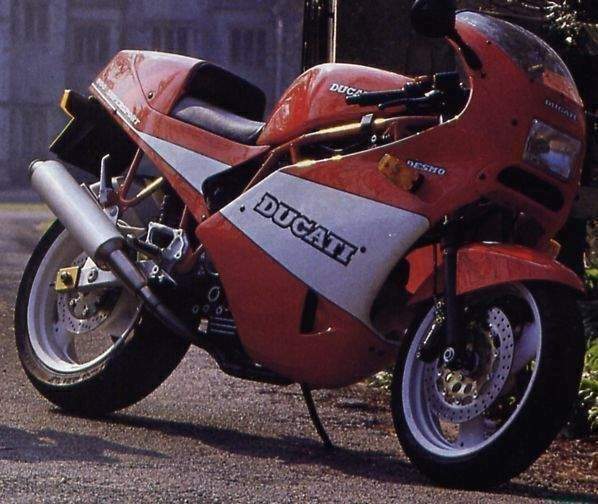 )with the sporty allure of the bike, but also that it is not as cramped and compressed as it used to be on the Fl Replica or even on the larger MHR, where you either liked the riding posture and style, or you just had to live with it, period. This bike is very sporty, but absolutely not fatiguing at it, and they had to shoot me between the eyes to stop me from circling Misano till I would run out of gasoline. running from the bottom i steering head to a cross member drawn between the two top tubes where they bend to meet the steering head, or the other way around, or sheet metal bracings. This area deserves better attention than it has received from the Ducati technicians. It must be pointed out that in all other riding circumstances other than the one analyzed above the torsional rigidity of the 750 Sport frame appeared up to the job by a reassuring margin, as the high speed cornering characteristics proved. And now, the engine. This is a complete Paso unit lifted out of a Paso and shoe horned into this modified Fl frame. The only advantage the new installation should offer in comparison to the original one is that the engine does not live inside an all enclosing cocoon, thus air flows more freely around it and even at low speed through traffic it does not turn into a hot bubble inside which the carb inhales and the bowl of the same carb gets hot causing the gasoline inside it to boil and sending idle carburation to hell. Air circulation is so much more abundant and free that the two large oil radiators typical of Paso's cooling system have been discarded. All other working conditions being the same, torque and power delivery characteristics are same as on the Paso. Yet you can hardly recognize the unit from the performance level it delivers in combination with the rolling gear it is framed inside. Acceleration is very brisk, pick-up is exhilarating, top speed is regularly clocked at 134mph. The equally powered Paso is left in the dust. The engine feels like it was Carl Lewis sprinting with two Soviet Army overcoats buttoned-up and then he finally found the way to unbutton and drop them: quick and fast again, agile on his thoroughbred ankles once again. Inside 750 Sport the light and lively air cooled twin is just right: exiting Misano's fastest bend at llOmph it would still acclerate all the way to 125mph by the time you hit the brakes to enter the hairpin at the end of the main straight, which is only 400 meters away. That is real pushing in fifth gear. Then you lean it till you hit the macadam with you left knee, and then some more till the peg comes in contact, then you open up, either in third, if you wanna use the rewability of the desmo unit, or in fourth, if you wanna take advantage of the flat torque spread. Then you are ready to zap the competition down the short chute leading into a right hander. Here you repeat, and then again into the following left hander and then, you know what, till you run out of knee padding. Like real motoring. But with legally muffled exhausts. A great motorcycling experience. 750 Sport is far less exciting in terms of styling and graphics. The fairing halves do not mate properly and the top half, with the plexiglass bowl, has got lines which are too rounded and make it look like a "fat kid" face. To make things worse, the bike sports graphics which seem to have been adopted from best Italian moped tradition, with mini and maxi flashes of bright blue against the red background, four of them per each side: even the most dedicated Ducati enthusiast will not succumb to them. This bike promises to be a classic in its own time, bridging the Ducati tradition of real sports bikes and today's needs for civilized motorcycling in the most rational, effective and rewarding way. For a sporty bike she is even comfortable and non-fatiguing. She just deserves an appropriate look: what would you say of bright red with black and white pin-striping. Or black with red and white pin-striping, or . . . you name it, as long as it is classic looking. For Desmo's sake!